By now, most people have probably heard of Edward Snowden, the former CIA contractor who leaked the NSA’s surveillance documents, as well as Chelsea (formerly Bradley) Manning, the Army private who leaked diplomatic cables to WikiLeaks. Barrett Brown, however, remains largely unknown — despite the fact that his case is arguably even more of an outrage than either Manning or Snowden. While both of them were charged for deliberately leaking classified information, Brown was indicted and could face years in prison for the simple crime of reposting a link on an Internet Relay Chat channel. How is such a thing possible, you might ask? Isn’t posting a link the type of thing that billions of people do every day — and isn’t the process of posting a link to such material something journalists of all kinds do routinely? The answer to both of those questions is clearly yes. 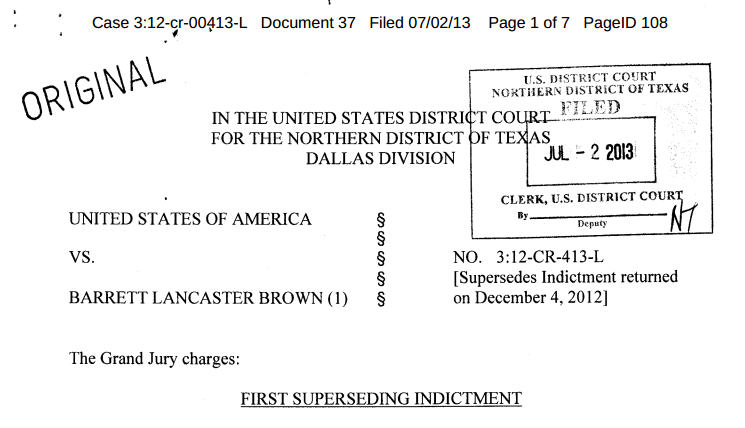 But regardless, Brown stands accused by the District Court in Texas of a series of charges including trafficking in stolen credit-card information, which could result in a lengthy jail sentence (Brown was also charged with threatening a federal agent, after his mother’s house was raided by agents looking for his laptop). Can posting a link be a felony? Does a hyperlink involve either possession or illegal transfer? It’s difficult to see how. If it does, then my posting the same hyperlink here would presumably be illegal as well (here’s a link to the Stratfor emails at WikiLeaks, which don’t contain any credit-card info). But more than that, the IRC chat thread where Brown posted the link was explicitly set up by him to crowdsource information about intelligence contractors like Stratfor and their ties to the U.S. government — which as the Committee to Protect Journalists points out, should make every journalist concerned about the charges against him. One reason why Brown may not have seen a groundswell of broad support for his cause (although there is an effort to create one) is that he falls in that increasingly large grey area between journalist and activist. The 32-year-old Texan is a member of the shadowy hacker group Anonymous, and for a time was widely quoted as a spokesman for the group, but he is also a journalist who has written for a number of online outlets about the rise of the surveillance state — which arguably puts him in the same camp as Guardian writer Glenn Greenwald, who has been working closely with Edward Snowden. Since the Snowden leaks, there have been many attempts — including some by journalists like David Gregory of NBC — to argue that Greenwald isn’t a “real” journalist, or that he should also face charges for his dealings with the CIA contractor, a view that plays right into the hands of some U.S. legislators, who are eager to crack down on classified leaks by government sources, and by extension are doing their best to criminalize the act of investigative journalism. As many have pointed out, including journalism professors Jay Rosen and Jeff Jarvis, what needs to be protected isn’t “professional” journalists or specific media outlets, but the act of journalism itself. The only relevant question is what Barrett Brown’s purpose was in posting that link — was it to “possess with intent to use unlawfully?” Or was it to share the Stratfor documents with others who could add more detail about the firm’s ties to the government? If it’s the latter, then it should qualify as journalism and therefore be protected. Sites like Gawker have tried to argue that Barrett Brown doesn’t deserve support because he is an “Anonymous fameball” and “megalomaniacal troll,” and that these qualities somehow outweigh any contribution he may have made to journalism. But if we only supported journalists who were meek and didn’t seek the limelight or hold any uncomfortable views, the list of those deserving our support would be virtually non-existent (Brown, who has been writing from prison, agreed on Wednesday to stop discussing the case in the media). As I pointed out in a post about Andrew “Weev” Auernheimer, who was convicted of computer crimes under the ridiculously flawed Computer Fraud and Abuse Act — the same law that was used against Aaron Swartz — just because someone is a troll doesn’t mean we should turn a blind eye to the fact that the charges against them are absurd. And if we do, we give up the right to be concerned when the same laws are turned against someone we like. Thank you for sticking to the facts in this article rather than swaying to the opines of many of those commenting here. In reading the court document I find nothing to imply that Brown is implicated in either obtaining or publishing this information illegally. No mention is made of his participation in a hack to get them, and no mention is made that he uploaded the document to the location mentioned in the link. Even more telling is the mention that the link was “transferred” from #AnonOps to #ProjectPM. For those unaware, the channel #AnonOps is one of the most public channels on an Anonymous IRC server. It’s more or less the main lobby. On most IRC servers anyone can create a channel, in this case Brown had created #ProjectPM. A quick review of the current channel’s setup reveals that it is not a private channel. ( More information about the project can be found at http://echelon2.org and http://barrettbrown.blogspot.com/2012/05/purpose-of-project-pm.html). While not a private channel, it is made very clear that #ProjectPM is an area for collaborative journalism. #AnonOps is a channel that is primarily used to communicate current operations Anonymous members are planning. The actions he took in copying that link and pasting it to #ProjectPM are no different than any journalist sharing information they had obtained during investigation with their co-workers. In this case he had even taken the precaution of not hand-delivering the documents, but rather simply pointing out their location. On the question of whether or not these documents were public: If a link is published in #AnonOps, it has been published in the most public fashion available on that server. #AnonOps typically has hundreds of users at any given time. Given that his accusers obviously had access to the logs on this server, the only possible way these charges could hold up is if they can prove any of the users in #ProjectPM were not also in #AnonOps. This list is simple to obtain from a logging perspective, and I would challenge the prosecution to publish those lists. IMHO, Gpla’s comment re “block dumps” is most salient. Agreed, this is a fairly shoddy piece of “journalism” on Matthew’s part. There is not even a cursory examination or even repudiation of the charges, just a statement that Brown’s “intent” is all that matters here. He wanted to share information so that any crime committed as a result of that effort is excused. This “case” is a joke. It is another example of the police state tactics that government is using to silence dissent. What a balanced and well argued reply. Perhaps instead of amplifying your own position you might engage in a discussion. Instead of answering questions posed, or pointing out flaws in logic, or offering differing perspectives you say “government’s erosion of our civil liberties” as if that magical mantra excuses all criminal and immoral acts in its service. There is a phrase for that kind of methodology, “The ends justify the means”. It has been used to great effect by tyrants and revolutionaries alike. Doesn’t matter what the wording is. Most of the current laws, in almost all countries were written long before the internet was an idea, maybe even before the telephone was invented. To get past this, both sides usually try bend the existing laws using ambiguous expressions like that. Sort of like politicians do, but with a clear idea who will get hurt. To see exactly how badly outdated laws are, just take a look at the ebook price fixing scandal with Apple and friends for instance (there are better examples, but that’s just a pet peeve of mine). So, if a journalist/activist hacks into a corporate database and posts the information in a public forum they have no liability? Say for instance a reporter at the Washington Post hacked into the database of Globo Corp and revealed sensitive and embarrassing confidential material. Is that illegal, can the reporter be held liable for the crime of breaking into and revealing private information? Where does the line get drawn? Who decides the “newsworthiness” of the information? Thats why block dumps of material are so tricky, no one is vetting it or taking into consideration what is or isn’t worthwhile. The cry of “Total transparency” doesn’t cover every sin of those who “act”. And that’s the distinction between the whistleblower and the journalist. If there’s overlap, then there’s probably the threat of prosecution. Let’s take the Pentagon Papers as an example, since the facts are well known, though there was not a clear legal outcome. The Washington Post and New York Times did not steal the material, but they did receive it. The first amendment extends or should extend to their publishing of it including that they were arguably selling it as a part of that publishing. If they’d tried to sell it to a competitor, they’d have no such protection, Ellsburg on the other hand faced actual prosecution which didn’t happen because of severe governmental misconduct. The parties were offered the option of going back to trial court and litigating it, but they all chose not to. As Rosen and Jarvis (and probably most mass comm law journalism professors as well) argue, this isn’t a right given to specific individuals, it’s a right given to the “press” which was in colonial times not newspapers (there were very few) but were essayists like the folks who wrote the Federalist papers which informed the public of ideas and actions the government did not want them to know. It is pretty clear that historically the press has had immunity from prosecution in publishing purloined material as long as they weren’t the ones doing the stealing. There isn’t such a thing as an “IRC thread” and saying IRC chat is a bit of a pleonasm since IRC means Internet Relay Chat. Also you post “on iRC” not “in”. As for his guilt, not familiar with the case so it’s not very clear. Was the info already public , did he knew what was in it , was it a channel or a PM ,if a channel , was it private or public. Having a private chat online is like having a chat in real life not like publishing in a paper, if it was a public channel i guess one can argue that it is somehow similar to journalism. The intent i guess is relevant too and if the purpose of the channel was to investigate ,then the intent is clear and it’s close enough to investigative journalism. Thanks for those tips on IRC grammar :-) I should have probably said channel — my understanding is that Brown posted the link (which had already been posted elsewhere) to a public channel. I’m not sure whether he knew what was in the documents that were at the end of the link, I assume that will come up during the trial. You have channels and PMs , no threads and you post “on IRC” but when it comes to channels and PMs you say “in #channel” (or in PM) . The hashtag is how channels are designated and where most likely Twitter got it from,the use of @ on Twitter is also most likely borrowed from IRC ,actually IRC is most likely what inspired the creation of Twitter ,kinda like iRC but different and on the web. And while at it ,IRC had a large contribution to the SMS jargon. Everybody used to use it,guess now with the mobile revolution it’s rather old school.